Why Urbana, Why Missions, Why Missionary Insurance? “Why Urbana?” “Why missions?” “Why overseas travel insurance?” You ask? Okay, this is easy. Go to Urbana if: You want your life to have significance; You like being obedient to the God of the nations. (Even if that means going overseas. ); or You want to make a difference in the lives of others – The lost, disadvantaged, poor, sick, orphaned, militant,…Especially those most lost, disadvantaged without opportunity to help themselves, those desperately poor, those sick unto death, those forgotten orphans that we don’t see because they live far away. 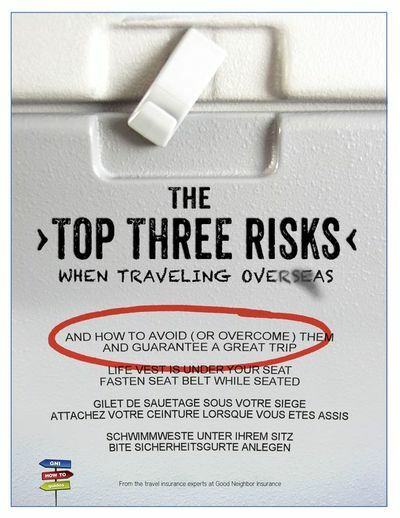 Get The Top Three Risks When Traveling Overseas Here. Watch the Video: Why Travel Insurance? Urbana, as you have heard, is simply amazing. passion to fulfill that direction. Urbana Student Missions Conference only happens every three years so you don’t want to miss it. WHY GO OVERSEAS – BE A MISSIONARY? Because your U.S. coverage probably stops at the border/you’ll be outside their coverage area. Because the same people who go to Urbana, and go overseas either long or short-term, are the same people who need good overseas travel or health insurance. They tend to think of others first. And may neglect to spend the time and money to protect themselves. They tent to be idealistic. Bad things do happen overseas. Violence, accidents, sickness, even horrifying versions of all the above. Isn’t it important, even helpful, that family members know someone is looking after you in case you need to be politically or medically evacuated? That they won’t have to face a $20,000 bill to get you back home in an emergency? Isn’t $30-40 worth it for their benefit alone? They tend to wait on God to tell them. Certain items are commonsense. You’ll need to pack. You’ll need a ride to the airport. You’ll need some kind of money to pay for food. And you need to make sure that you/your family are protected and that your finances are protected against the unexpected. They tend to want an organization to tell them what’s needed/expected. We cover many organizations and many, many more short-term teams insurance needs as well as provide thousands of short-term missionaries international medical insurance as well as overseas property insurance. Career missionaries love Good Neighbor and our level of service and helpfulness when they are far from home. Because being sick or hurt can really ruin the party. Or the summer project. Or the cross-cultural experience. Not to mention your effectiveness on a short-term team or as part of a group or non profit organization overseas. Because poverty, educational opportunities, employment, knowing God, having sight, and many, many more similar issues are so important; and you simply can’t expect to remain making a difference in the lives of others without being adequately protected yourself. There are simply too many reasons why these particular places are difficult situations to work in. Don’t presume that you can go there, or live there, without being affected yourself. Get good insurance.